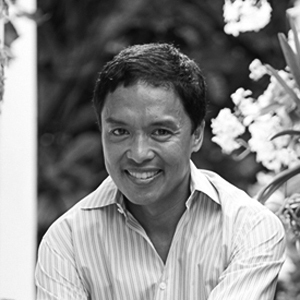 Mario Nievera is principal of Nievera Williams Design, a landscape architecture and design firm with offices in Palm Beach and New York. Mr. Nievera received his B.S.L.A. degree from Purdue University in 1987. Prior to starting his own firm, he worked as a principle in the Boston and Palm Beach offices of the landscape architecture firm Morgan Wheelock Incorporated. In 1995, he returned to Purdue as a visiting professor of design. Mr. Nievera’s current and past landscape design projects include restoration and concept design for Old Trees, a 19-acre estate and gardens attributed to the Olmsted Brothers in Southampton, New York, and landscape renovations and additions to an 8-acre Stanford White-designed residence in Martha’s Vineyard as well as projects in Connecticut, Florida, New York, Rhode Island, the Bahamas, and Canada. Nievera’s work has been featured in publications such as Architectural Digest, W, Southern Accents, The New York Times, Town & Country, House Beautiful, The Wall Street Journal, Vanity Fair, and Garden Design. He has sat on several professional awards juries and is a Board Member of the Horticultural Society of New York. Nievera divides his time between residences in Palm Beach, New York City, and East Hampton.